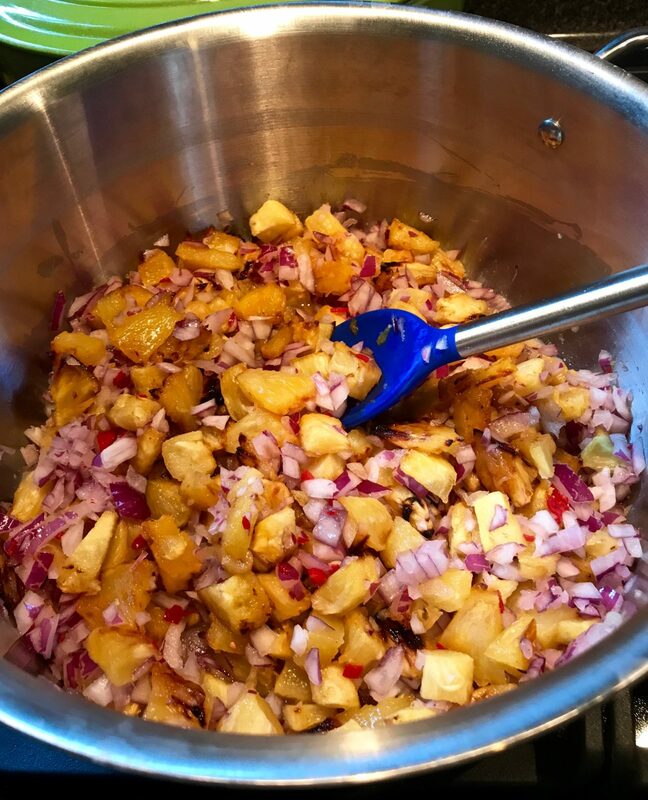 With the last remaining Ghost Pepper from my friend Joseph’s garden, I made a variation of the Caramelized Pineapple Habanero Salsa found in the Best of Ball Home Canning & Preserving book. All I knew about ghost peppers (Bhut Jolokia) was that they are HOT, in fact, I believe they are among the hottest peppers in the world as measured on the Scoville Heat Scale. I originally learned of the Scoville Heat Scale while eating Indian food at the Mint Leaf in Pasadena. Ghost Peppers clock in at 1,000,000 heat units (YES, one million!) while jalapenos rate around 2,500 to 8,000 Scovilles and Habañero’s rate at 100,000 to 350,000. So, to say I was scared to work with these babies was an understatement. 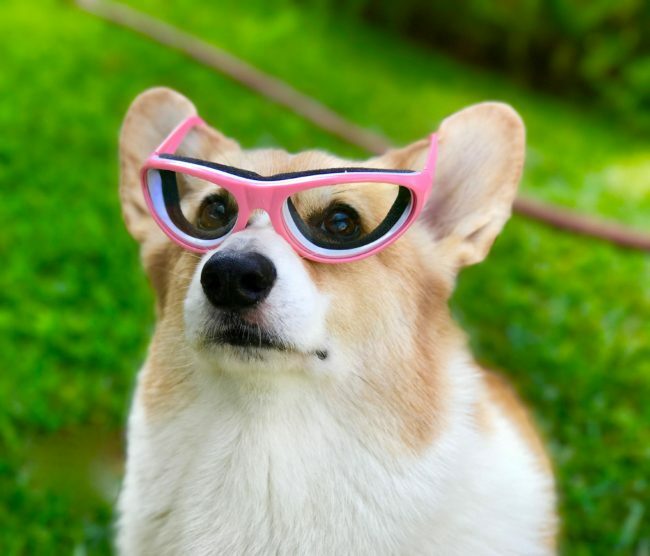 The first thing I had Tom do was order a pair of goggles for me from Amazon. Of course, Tom ordered a pair of goggles for the dogs, too, just in case they traipsed through the kitchen while I was cooking. Donning disposable latex gloves and my goggles, I warily seeded and minced the Ghost Peppers. I have to say I did not smell them but I was not brave enough to taste one before cooking. I carefully peeled off my gloves and washed my hands and knife. The cutting board went straight into the dishwasher in case there was any left-over pepper residue. So, now you know, you need to be very careful around these peppers. I am sure I am not the only one to have minced a hot pepper and then mistakenly rubbed my eye (or am I???). Tom went to our local market (nice to have a man servant!) and talked to the produce person about how to select a ripe pineapple (if the leaves pull out easily then the pineapple is ripe). As we needed two pounds of chopped pineapple, the produce person recommended we purchase three pineapples and after peeling and coring, it worked out to just the right amount of pineapple. That must be why he is the produce manager. While watching a YouTube video on how to peel and core a pineapple, we learned an interesting factoid that the sugar in the pineapple settles to the bottom when standing upright so you need to turn the pineapples over for about half an hour before cutting to redistribute the sugar throughout the fruit. 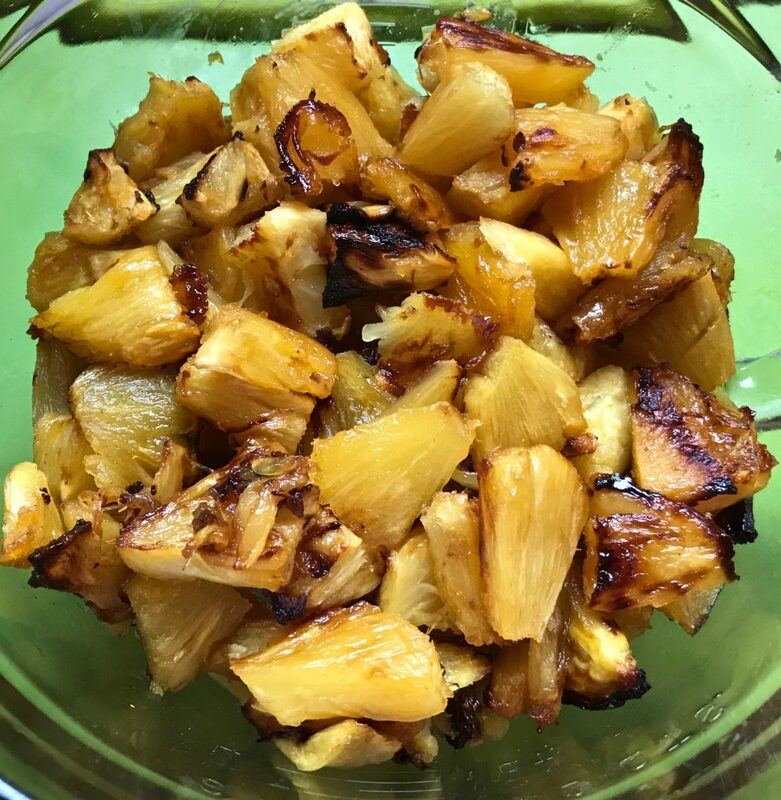 I think you would be fine using pre-cut pineapple or even unsweetened canned pineapple for this recipe to save some time, although I have not tried that yet. 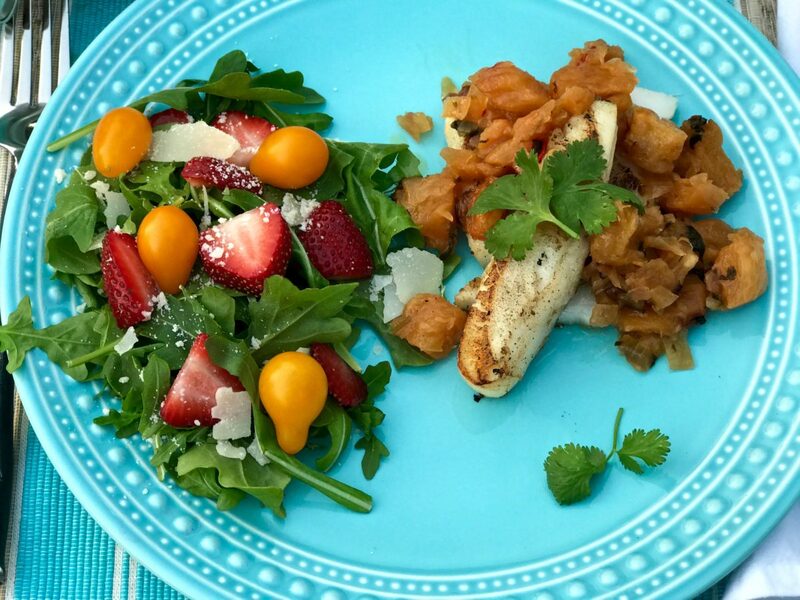 This recipe is all about the caramelization of the pineapples, the heat of the peppers and the crunchiness of the red onion. Be sure no one comes through (Tom!) and eats the caramelized pineapples as they cool — they taste just like a pineapple upside down cake. The recipe called for one Habañero pepper, which I replaced with the Ghost Pepper, and as I was feeling braver about the heat of the pepper at this point, I also popped in two Serrano Chilies picked from my garden. Depending on your heat tolerance, any combination of hot peppers will work. Just remember to wear your gloves and don’t rub your eyes! 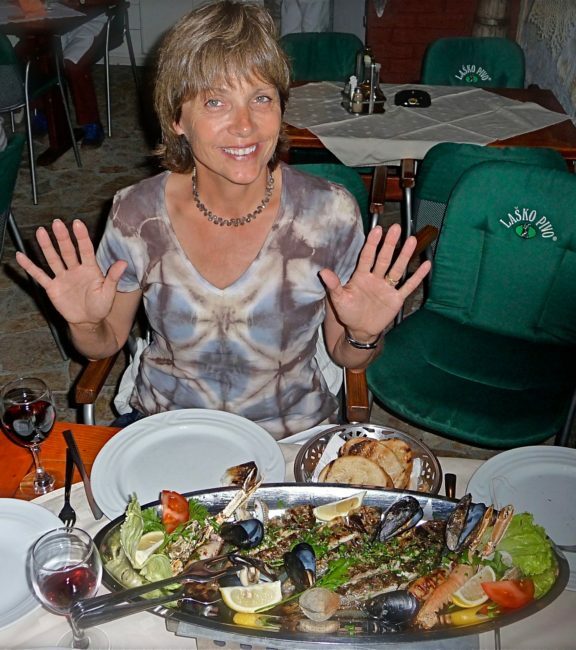 …but we tried it with a Chilean sea bass (excellent). 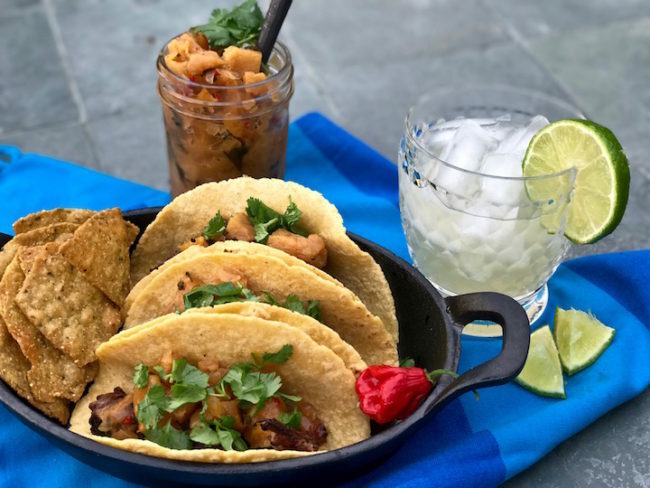 We also put this on carne asada tacos using the Yellow Corn & Wheat Tortillas from La Tortilla Factory (highly recommend La Tortilla Factory tortillas…they don’t fall apart and taste great). I think this salsa would also be fantastic on a Canadian Bacon pizza or just scoop it up with some tortilla chips! I need to make more …. Preheat oven to 400°F. 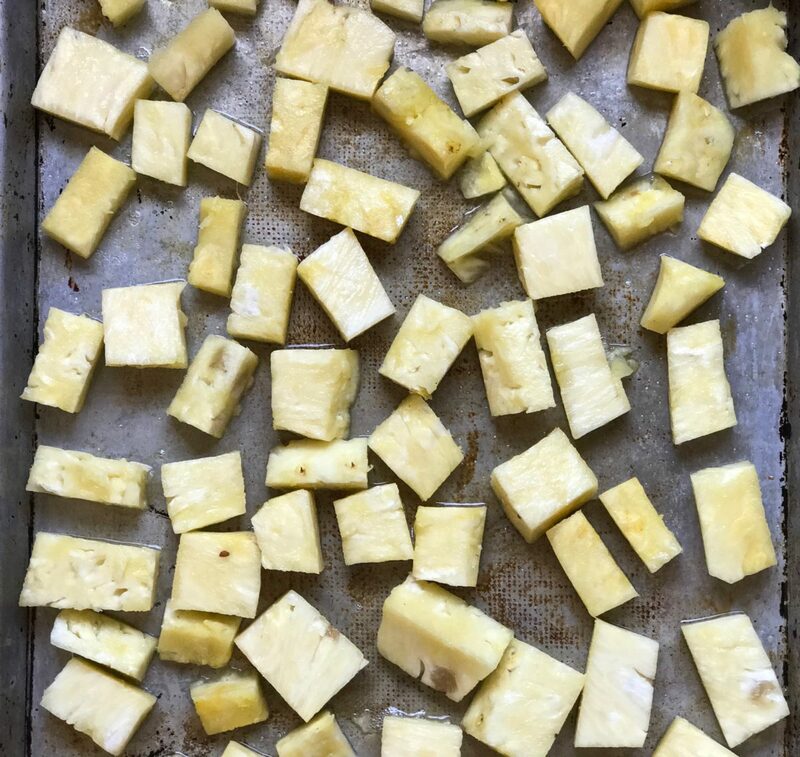 Cut each ½” wide pineapple slice into bite-sized pieces (you should have about 6 ½ c. chopped fruit). Spray two rimmed baking sheets with cooking spray. Place chopped fruit in a single layer on the baking sheets and sprinkle with 4 T. of the sugar. Bake for 15 minutes. Turn the fruit over with a spatula and bake 10-15 more minutes until the pineapple is beginning to caramelize. Remove from oven; cool slightly. Don’t allow them to cool completely in the pan or they will stick. 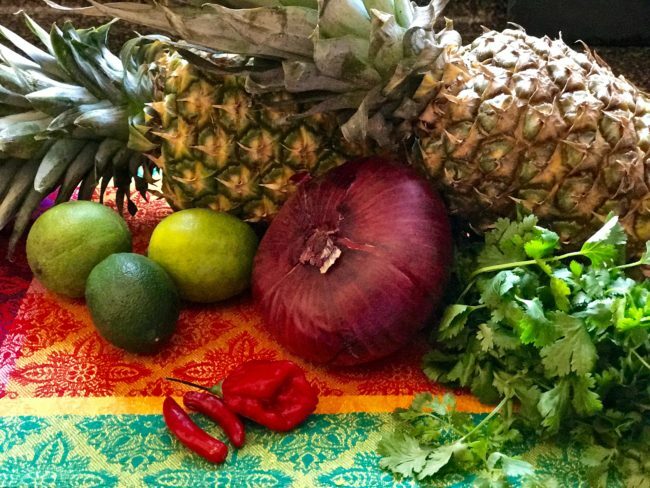 Combine pineapple, onion, lime juice and peppers in a large stainless steel or enameled saucepan. Bring to a boil over medium heat. Once boiling, cook 5 minutes, stirring occasionally. Stir in the cilantro, salt and remaining 2 T. of sugar. Cook over medium heat 5 additional minutes or until thoroughly heated, stirring occasionally. While the pineapple is baking, sterilize your canning jars and bands in a large pot of boiling water. Leave the jars on low simmer until ready to use them so they remain warm. When the salsa is ready, carefully remove the jars from the hot water with tongs. Ladle the salsa into the warmed canning jars leaving ¼” space at the top of the jars. Run a knife around the inside of the jars to remove any air bubbles. Wipe jar threads and rims with a clean damp cloth so they don’t stick shut. Cover with lids; apply screw bands until finger tip tight (don’t over tighten or there is no room for expansion). Process the filled jars in boiling water for 10 minutes (start the timer when the pot has returned to a boil). Carefully remove from water and let cool completely on the counter with a rack or towel underneath. That pinging you hear is a sign of a good seal, however, you still need to check the lids. 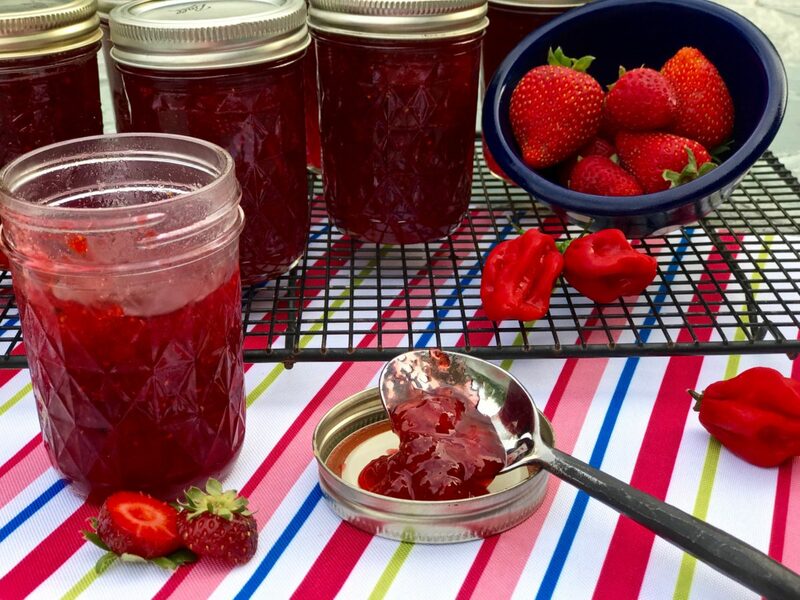 Check out www.freshpreserving.com for the correct method of preserving foods.